(2) A "dwarf planet" is a celestial body that (a) is in orbit around the Sun, (b) has sufficient mass for its self-gravity to overcome rigid body forces so that it assumes a hydrostatic equilibrium (nearly round) shape2 , (c) has not cleared the neighbourhood around its orbit, and (d) is not a satellite. (3) All other objects3 except satellites orbiting the Sun shall be referred to collectively as "Small Solar-System Bodies". 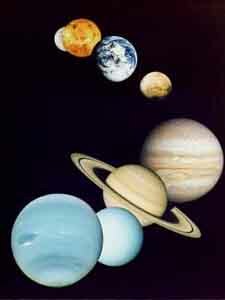 1The eight "planets" are: Mercury, Venus, Earth, Mars, Jupiter, Saturn, Uranus, and Neptune. 2An IAU process will be established to assign borderline objects into either dwarf planet and other categories. 3These currently include most of the Solar System asteroids, most Trans-Neptunian Objects (TNOs), comets, and other small bodies.